Preheat the oven at 180C. 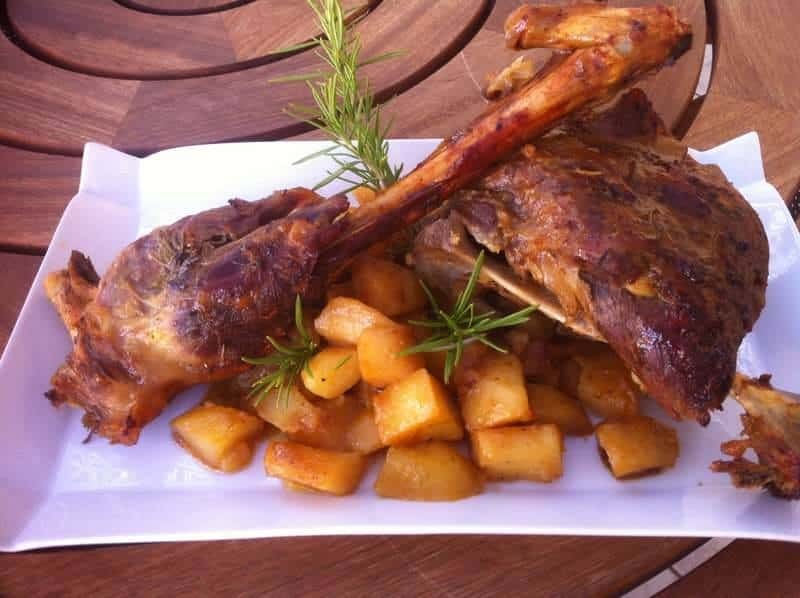 To prepare this super easy Greek roast lamb recipe, place the lamb in a large baking tray and scar the surface of the meat with a knife. Make little holes (8-9) on the surface of the lamb, using a sharp knife. Chop the garlic into 3-4 pieces each clove. Fill each hole on the lamb with some garlic and some rosemary. Drizzle with 1-2 tablespoons of olive oil and season well with salt and pepper. Pour into the baking tray 1 and 1/2 glass of white wine and cover with aluminum foil. Bake in the preheated oven for 1 1/2 hour. The potatoes and the lamb cook at different times, so you should add the potatoes later. After 1 1/2 hour remove the baking tray from the oven, unwrap the aluminum foil and add the potatoes (cut into wedges and seasoned well with salt and pepper). Drizzle with 1-2 tbsps of olive oil. At this point, there should be enough liquid remaining into the baking tray. Place some aluminum foil on the baking tray and bake for 1 more hour. Turn the pan out of the oven and unwrap the aluminum foil. At this time, there should be a little wine still remaining in the pan and your Greek roast lamb should be almost cooked, but not colored. Prepare the glaze for your Greek roast lamb. Into a microwave, heat the honey, until it becomes liquid. Blend the honey with the mustard and lemon juice. With a cooking brush, brush the glaze over the lamb and the potatoes. Sprinkle with some black sugar (optional), so that the meat becomes more crunchy. Place back into the oven (uncovered) and bake for 20-25 more minutes until the lamb is nicely coloured. Let the meat rest for 5 minutes before serving. Enjoy this delicious honey-glazed Greek roast lamb with a nice Greek salad and creamy tzatziki sauce! Sounds great, I look forward to trying it out. Awesome Joan. Let us know how it turned out and what you think of it.